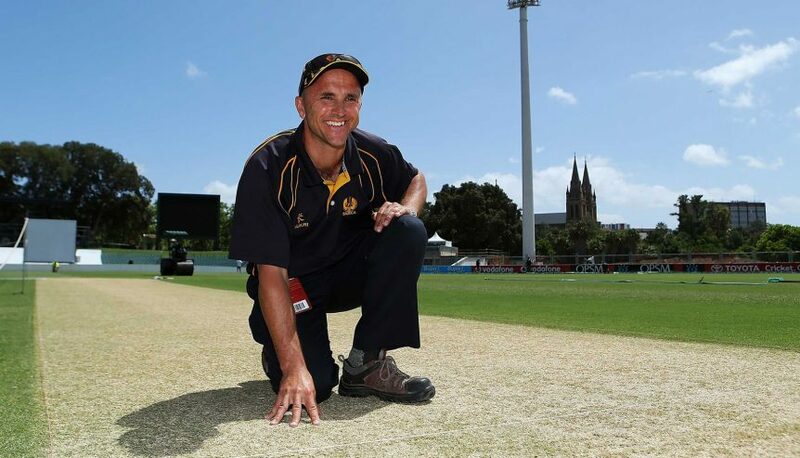 The fast bowling attacks of Australia and India will be pleased to hear the lush green grass that has covered the Adelaide Oval pitch for the past three day-night Tests is set to return for Thursday’s Test opener. Adelaide Oval curator Damien Hough said he sees no reason to change the thick grass coverage that was employed to protect the pink Kookaburra ball in the venue’s captivating twilight Tests for the highly-anticipated clash between fierce rivals Australia and India. “We won’t do anything differently,” Hough told The Weekend Australian. “The preparation will be the same. The only difference is we get the covers off earlier and we start earlier. “We do the same preparation for red-ball cricket and pink-ball cricket at Shield level. The best way to get an even contest is to leave some grass on there and get that balance between bat and ball. The inaugural day-night Test in 2015 against the Black Caps lasted three days as the players, officials and groundstaff adjusted to the unknown challenges of Test cricket with a pink ball under lights. The following year, the Test against South Africa lasted four days while 12 months later, the second Test against England finished in the first session of day five. Each pitch across those three matches had a healthy covering of grass and a lush wicket square to soften the wear and tear on the pink ball that had been known to flake on abrasive surfaces. But now the red Kookaburra ball will be used on a pitch with the same amount of grass as those day-night matches. The result could impact both sides in different ways. For Australia, a grassy pitch will undoubtedly suit their star-studded pace attack of Mitch Starc, Josh Hazlewood and Pat Cummins but could negate the effectiveness of chief spinner Nathan Lyon, who took a 12-wicket haul in the corresponding fixture four years ago. Lyon said he hopes to mirror his efforts from 2014 that saw him take seven wickets on the final day to bowl Australia to a 48-run win. “If I recreate that it would be amazing,” Lyon said after bowling NSW to Shield win over Western Australia this week. “It was an amazing Test match for what cricket can offer. It was a different Indian side back then. “But this Indian side, they’ve obviously got superstars right through from batting to bowling. A greentop would also favour India’s impressive seam attack, but could also hinder the output of captain Virat Kohli, who has feasted at Adelaide Oval in the past.